Spanning the period from the Tang to Qing Dynasties, the exhibition traces art, reflecting a political, economic and cultural golden age of China. The sources from which the painting have been gathered are just as exhaustive, with work from an extensive number of international collections, gathered in a single show for the first time. I was at once expectant, and filled with trepidation about, this exhibition, and was delighted to find that it did not disappoint. The exhibition is succinctly divided along chronological and thematic sections, into six darkened galleries, with paintings displayed around the edges of each room, and longer scrolls in glass cabinets running through the middle. 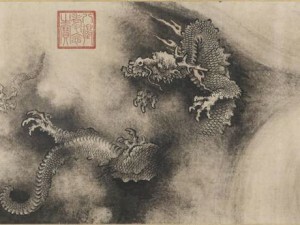 There were many examples of the more obvious schools, such as realist landscape paintings from the Song Dynasty, when the genre flourished, and more stylized works by the reclusive Yuan elite, who captured Nature to express their discontent towards suppressive Mongol rule, their purity and enduring loyalty. Amidst these, were scattered some works which informed a cultural context and whose unique viewpoints really stood out for me. As with the role of the Church’s patronage in Western art, the exhibition shows the influence of Buddhism (in early works of devotion), Confucianism (which pervades all aspects of traditional Chinese life), and also Daoism, an indispensible part of native Chinese philosophy and science. Five Planets and Twenty Eight Constellations, attributed to Zhang Sengyou (left), is one of the show’s highlights. The earliest surviving painting of astronomy from the imperial collection, it depicts the celestial bodies in highly imaginative ways that combine Daoist study and legend, showing the planets and constellations as half human, half animal beings, riding mythical creatures, their expression rendered even more vivid by the meticulous brushwork of the Gongbi style. 7 metres long, is the Nine Dragons (right), Chen Rong’s Daoist rendition of the dynamic forces of nature. The low, angled display cabinets mean one can lean right in and see, in detail, the remarkable movement in waves, mist and clouds as well, of course, as the dragons. The amazing depth and atmosphere achieved in this monotone work, and the sheer detail allow one to personify each of the “Shenlong”, their expressions ranging from fierce and stalwart, to almost confused, comical playfulness. As painting became more commercial, their subject matters changed. Portraits, romantic literary scenes and paintings of men at work, reflected the urbanization of Chinese society, and the demand for commissions from all social levels. Dujin’s Court Ladies of the Inner Palace, which shows women playing an ancient Chinese predecessor of football, presents an image from before the days of foot binding, quite at odds with the delicate and frail “three inch golden lilies”. It’s good to find that the curator, a native of Jiangsu, has brought something of himself into the exhibition, with Xu Yang’s Prosperous Suzhou (top left) as a representative of works on urban scenes of prosperity. 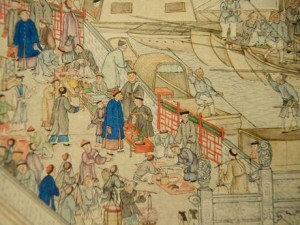 It is another long scroll, depicting the town in all its hustle and bustle. I could have spent a whole day just looking at that one piece, each and every scene hinting at its own story, from what goods and tools people are holding, what they are doing, down to the patterns on their clothes, banners and shop signs. Amongst the fairly evident developments shown in the last two sections “Challenging the Past” and “Looking to the West”, it was good to see the undercurrent of counter culture represented, in both techniques and subject matter. 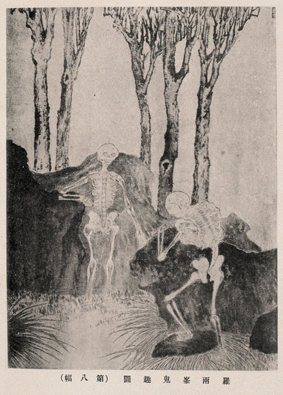 Qing artist Luo Ping’s eight Ghost Amusement pictures (right), a dark satire of contemporary society, have often been recognized as the beginnings of China’s native 漫画, “manhua” or comics.